The Ireland Warriors were definite favourites going into this match and the final score was probably a true reflection of the game. The Ireland Warriors have won two out of three International Cup grand finals losing to the P.N.G. Mosquitos in 2014. France commenced in 2011 with a ranking of 14th and improved in 2014 to 11th. Now they were up against the 2nd ranked team which had just previously defeated the world champions. In comparison France were overrun by 10th ranked Fiji Tribe. The ground was in immaculate condition and the breeze was blowing across ground and slightly favouring the to which Ireland were kicking. 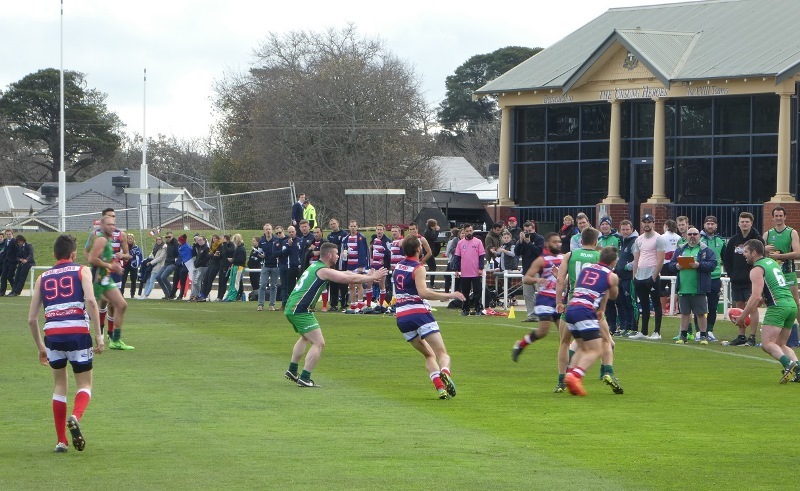 The ball immediately went to the dead wing and play continuously gravitated back there Fiachra O’Dheasmhunaigh #7 was seen marking and putting the ball into attack. Ireland started the third quarter well. Padraig Lucey #22 dropped a mark only for another player swoop and soccer a goal. David Mc Elhone #6 marked and goaled. It was starting to look a little grim for the French when against the flow the Coqs pushed the ball into the open and a French player managed to guide the ball through from near the 50m arc. 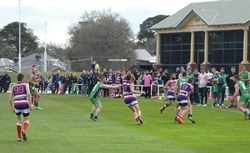 The French Coqs were pumped going into the last quarter having scored two goals through good play in the previous quarter but it didn’t take long for the Warriors to lock the ball into their forward line. Colin Lordan #19 took a handpass in the square for a goal. A collection of a rebound soccer kick allowed Irelend in for another goal. Declan Nannery #14 took a good diving mark and goaled. Padraig Lucey #22 finished the day with another mark and goal. Special mention to Patrick Brennen #16 who gave drive around the packs all day and threw himself into every contest. Also Vincent Monier #14 for the Coqs who led by example all day. Ireland continues to shape as a finalist but they weren't that impressive against a French side that keeps on playing with pride and vigor.